Germany is known for its beverages, history, and landscape, but as one of Europe’s largest and most diverse nations it has so much more to offer. Its regions vary in size and culture, each offering a different side of the country for its many visitors to experience. Beautiful historic architecture can be found throughout the country, including numerous palaces such as Neuschwanstein Castle and Nymphenburg, whose halls are open to touring sight-seers. Despite the appearance of its old-world architecture, Germany is a very modern, progressive country with plenty of opportunity for shopping, live theatre, and enjoying the region’s fine food and drink. German beer is especially famous for its craftsmanship and variety, which is celebrated annually with Oktoberfest, making fall a fantastic time to visit. Skiers will also revel in their chance to ride the Bavarian Alps , while others will still be able to appreciate the beauty of the vast mountain range. Germany offers its visitors a uniquely European mix of old and new culture amongst unparalleled aesthetic wonders. Sightseeing in the main cities includes the must-see sights. Among the many attractions in Berlin, you’ll visit Kaiser Wilhelm Memorial Church, badly damaged during the war and today a symbol of reconciliation. During your walking tour in Dresden, visit the courtyard of Zwinger Palace, one of Germany’s best-known baroque buildings. In Munich, visit the lively Marienplatz with its Old and New Town Halls. Here, observe the famous Glockenspiel, which re-creates a 16th-century wedding. You’ll also visit Weimar, where you’ll enjoy a pleasant orientation walk through the town to its pretty market square, and in Oberammergau, see the theatre where the Passion Play is held every ten years. 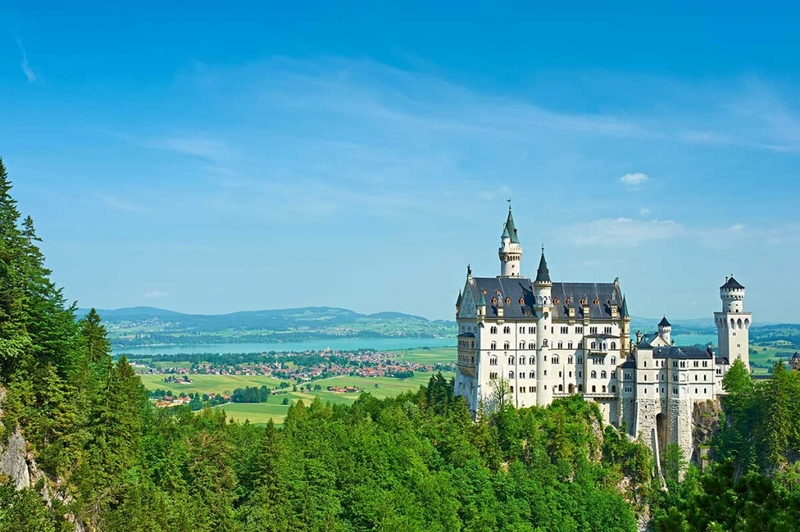 Highlights of this Germany tour are a drive along the Romantic Road past small villages to visit Neuschwanstein Castle, the fairy-tale castle of King Ludwig II nestled in the beautiful Bavarian Alps. Another unique experience Globus has included on this Germany tour is an overnight in medieval Rothenburg with its ramparts and towers, cobblestone lanes, and 16th-century houses. Of course, no vacation to Germany is complete without experiencing a lively Biergarten, and Globus has included a farewell dinner at one in Munich.